The Gold Coast spent today waiting in long queues for sandbags and battening down for 2015's most severe weather event, whilst Severe Tropical Cyclone Marcia is expected to make landfall on the central Queensland coast as a very destructive Category 5 cyclone. Severe Tropical Cyclone Marcia lies over the Coral Sea approximately 160km east northeast of Mackay. The cyclone is expected to turn more southwest during the next few hours and make landfall between Mackay and Gladstone early on Friday as a Category 5 cyclone. A trough extends southwards from the tropical cyclone near the Wide Bay and southeast Queensland coasts. 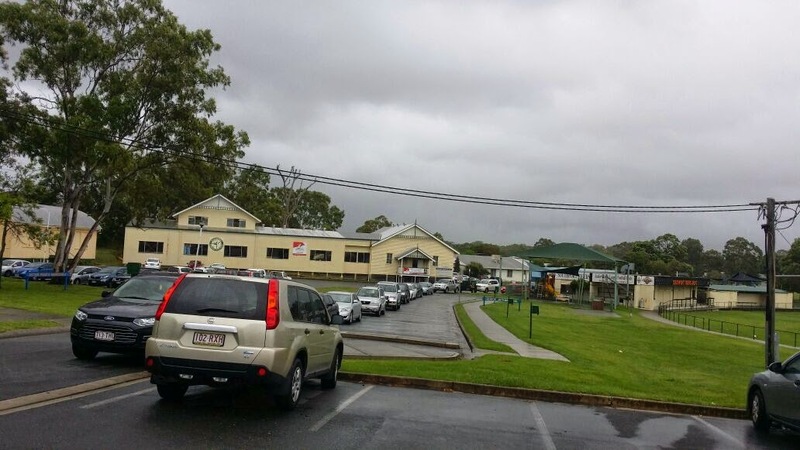 Mayor Tom Tate urged the Gold Coast not to panic, as concerned residents lined-up for sand bags provided by the State Emergency Service at Southport. “What I say to you is about midnight tonight is really when most of the potential major rain will occur and 10pm the next day." Widespread rainfall totals of 200-400mm are still forecast, with some 24 hour totals possibly in excess of 300mm. The heaviest rainfall is expected to fall within coastal catchments. The heaviest rainfall is expected to fall within coastal catchments. Heavy rainfall associated with the trough is forecast to affect catchments between Rockhampton and the NSW border from tonight through to Saturday. Damaging winds gusts of up to 90 km/hr are possible starting tonight into Friday (mostly near the coast and ranges) with sustained winds of 30 to 45 km/hr. 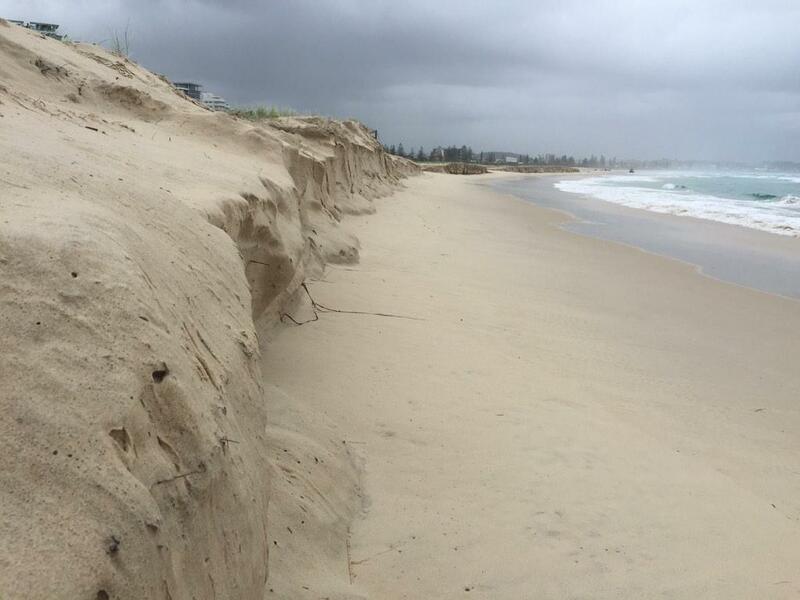 This morning a 2.17m king tide scarped beaches at Kirra, and more 2m king tides are expected Friday. City of Gold Coast Local Disaster Management Centre is now up and running to monitor the event. For further information, you can contact the Disaster Hotline on 1800 606 000. Issued at 6:00 pm Thursday, 19 February 2015. Severe Tropical Cyclone Marcia lies over the Coral Sea approximately 160km east northeast of Mackay. 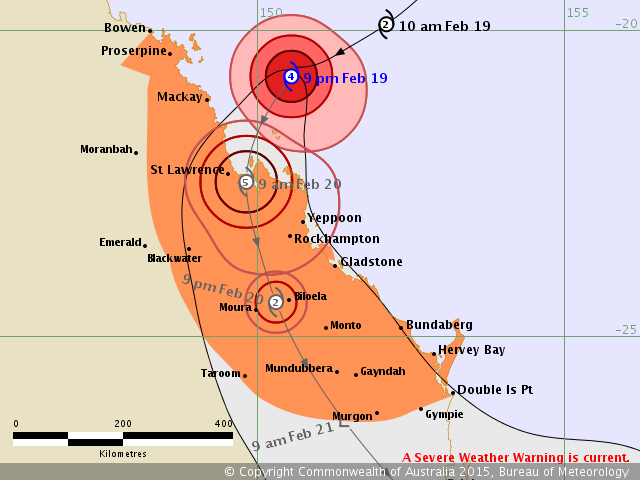 The cyclone is expected to turn more southwest during the next few hours and make landfall between Mackay and Gladstone early on Friday as a category 4 cyclone. A trough extends southwards from the tropical cyclone near the Wide Bay and southeast Queensland coasts. Heavy rain and locally damaging wind gusts are possible from the coast to the ranges between Double Island Point and Brisbane, extending to the state's southern border and the eastern Darling Downs and southern Burnett later tonight and Friday. The heavy rain may lead to flash flooding, with some 24 hour totals possibly in excess of 300mm. Damaging wind gusts may reach around 90 km/hr, mostly near the coast and ranges. A Tropical Cyclone Warning is current for areas between Bowen and Double Island Point.Tropical Cyclone Watch is current for adjacent inland areas between Bundaberg and Double Island Point. The next warning is due to be issued by 12:00 am Friday.